Renowned, award-winning author Avi pens a stark, unflinching tale of ordinary boys living in wartime as tensions — and desperations — mount among them. Twelve-year-old Patryk knows little of the world beyond his tiny Polish village; the Russians have occupied the land for as long as anyone can remember, but otherwise life is unremarkable. Patryk and his friends entertain themselves by coming up with dares — some more harmful than others — until the Germans drop a bomb on the schoolhouse and the Great War comes crashing in. As control of the village falls from one nation to another, Jurek, the ringleader of these friends, devises the best dare yet: whichever boy steals the finest military button will be king. But as sneaking buttons from uniforms hanging to dry progresses to looting the bodies of dead soldiers — and as Jurek’s obsession with being king escalates — Patryk begins to wonder whether their “button war” is still just a game. When devastation reaches their doorstep, the lines between the button war and the real war blur, especially for the increasingly callous Jurek. Master of historical fiction Avi delivers a fierce account of the boys of one war-torn village who are determined to prove themselves with a simple dare that spins disastrously out of control. Renowned, award-winning author Avi pens a stark, unflinching tale of ordinary boys living in wartime as tensions — and desperations — mount among them. This Book is about looking at war through the eyes of a child, the Button War is set in a small Polish village where the Great War is about to have a devastating impact. This is the story of twelve-year-old Patryk and his friends who have lived under Russian occupation for all their lives, but one tragic day, the excitement of seeing their first airplane turns to terror when it bombs their village. Soon the Russians flee the oncoming German army, and one set of occupiers is traded for another. While a war that will shake the world is taking place on their doorstep, the boys are deep in a war of their own, a hunt for military buttons, with the boy who finds the brightest and best becoming “king” of the gang. When one war bleeds into the other, the consequences are tragic. This is a forceful and moving book, the writing style is easy enough for a middle grade reader, but the story being told will appeal to the more mature reader too. The author has done, a really great job of setting the scene, and shining a light on the stark reality of the war. The characters are well rounded, and the communication between them is believable. As the book moves forwards to its conclusion there is a real sense of impending doom that really kept me interested until I finished the book. I would like to thank NetGalley and Publishers for the opportunity to review this great book. Special indeed are holiday stories with the right mix of high spirits and subtle mystery to please both adults and children–Charles Dickens’s “A Christmas Carol,” for example. 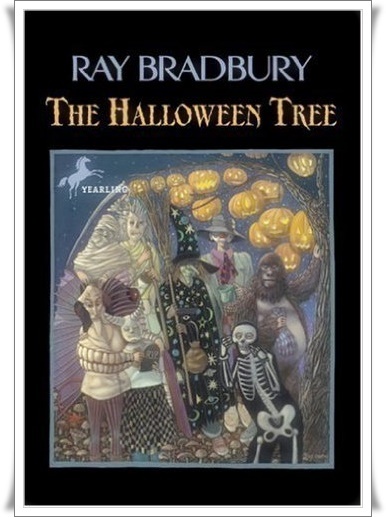 Or Ray Bradbury’s classic The Halloween Tree. Eight boys set out on a Halloween night and are led into the depths of the past by a tall, mysterious character named Moundshroud. They ride on a black wind to autumn scenes in distant lands and times, where they witness other ways of celebrating this holiday about the dark time of year. Bradbury’s lyrical prose whooshes along with the pell-mell rhythms of children running at night, screaming and laughing, and the reader is carried along by its sheer exuberance. Bradbury’s stories about children are always attended by dread–of change, adulthood, death. The Halloween Tree, while sweeter than his adult literature, is also touched at moments by the cold specter of loss–which is only fitting, of course, for a holiday in honor of the waning of the sun. This is a great book to read at Halloween time, for young and old alike. It captures the feeling of being a kid in a small town on Halloween and going trick or treating. Of course, the trick and the treat is that we are taken back through time to see how Halloween began: from ancient Egypt, through the Celtic Samhain, up to Bradbury’s day. For anyone to whom Halloween is a special time of year, this is a book to read.